While the storm raged outside yesterday, I was cozy in the kitchen. Code Name: Date with Zucchini. Our zucchini plants have been prodigious this year, as they are wont to be, and Hurricane Irene gave me just the excuse I’d needed to offload all that green. I spent all day baking, not just zucchini cookies, but muffins and cake as well, which I will of course be sharing. Because if you aren’t sharing the vegetables themselves, you’ll be sharing whatever you make with them. Oh yes. I found today’s recipe in my favorite cookbook, Simply in Season. It offers two variations on the theme. 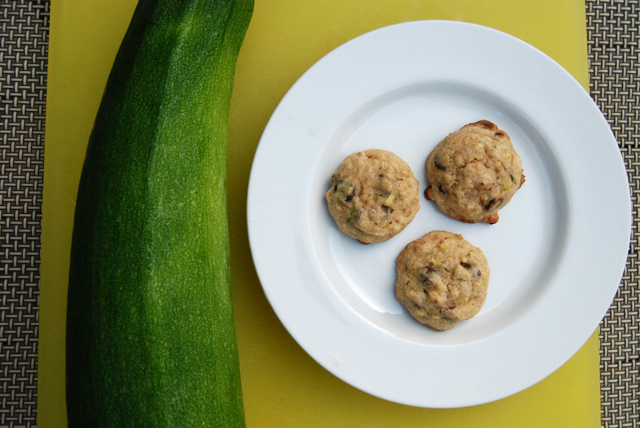 The first, an extra moist spice cookie (thanks to all that zucchini), studded with chewy raisins and chopped walnuts. If you’re not big on raisins, feel free to substitute your favorite dried fruit instead. Or do like I did and opt for the second cookie variation: Chocolate Chip! I won’t lie. I am a chocolate girl and not just liked but LOVED these cookies. 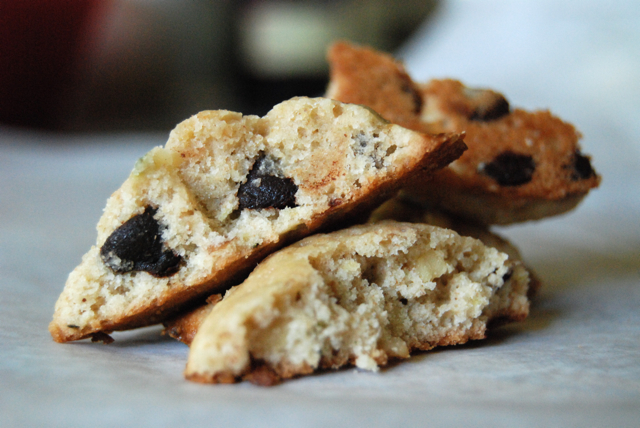 They’re every bit as addictive as a standard chocolate chip, but virtually guilt free. With all that hidden zucchini and whole wheat flour, I mean, C’MON! Plus, the zucchini makes these almost cake-like; you just won’t believe how soft and moist they are. Recipe adapted from Simply in Season. Yields 4 1/2 dozen cookies. Preheat the oven to 375 degrees. Get out a couple baking sheets and grease lightly; set aside. Using a mixer, beat together the butter and sugars. Add the egg (and vanilla, for chocolate chip variation) and beat until fluffy. In a separate mixing bowl, stir together the dry ingredients. Add to the batter, alternating with the shredded zucchini. Stir in the raisins & walnuts (or chocolate chips) and mix well. Drop by rounded teaspoonfuls onto the greased baking sheet. Place on middle rack in oven and bake 10 minutes. Remove from oven and place cookies on a wire rack to cool. Store in an airtight container. This entry was posted in Cookies, Vegetarian and tagged Simply in Season. Bookmark the permalink. 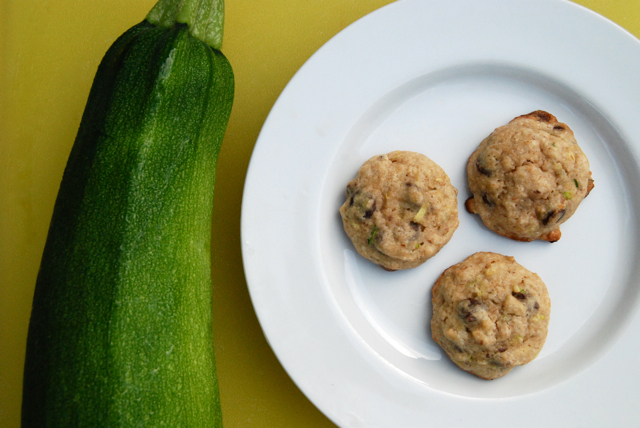 19 Responses to Zucchini Cookies, 2 Ways! This looks like a great idea. My mother sometimes makes zucchini bread, and I bet she’d love to try these, too! I wasn’t sure how close you were to Irene’s path – even though things didn’t sound as bad as initially predicted I’m sure it was still a bit scary! I hope everything is okay, Dishy! The best news? The wind blew over our super heavy basketball net, just missing both of our cars. A little close for comfort but I’ll take it! I was busy cooking up a storm DURING the big storm too! These cookies look fantastic! So . . . they don’t taste like zucchini? You must get some zucchini texture, though, right? Photo of the inside on the next post, please! I’m overdue to bake some cookies…This sounds and looks delicious. Love zucchinis. I was skeptical at first, but after baking them I couldn’t stop. eating. them. I must have had at least a dozen & a half – & perhaps I should be ashamed. But I’m NOT! My neighbor just gave me two giant zucchini, and now I know what I’ll be making with them! Although I can’t decide… Usually I go for anything chocolate, but the spice ones sound good, too. One question- Do you peel the zucchini before grating it? I too am partial to chocolate. Really hope you enjoy them! How the crap have I missed you?! This is amazing. I’m making these stat. Cassie, you are too funny. Hope you enjoy the cookies! I made both versions today (couldn’t decide!) and they were delicious!! Thanks for sharing! Awesome to hear!! Thanks for letting me know! Thanks Spicy!! Hope you had a great weekend too. They sound delicious! I love using zucchini in desserts because my kids never knowit’s there, and it’s the perfect way to sneak in a little extra nutrition. Yeah – I know!! How great is that?! bwhahahahh..